The king began to be weary of his favourite, the earl of Somerset; and many of the courtiers were sufficiently angry and incensed against him, for being what they themselves desired to be. These, therefore, were pleased with the prospect of a new favourite; and, oat of their zeal to displace Somerset, did all they could to promote Villiers. 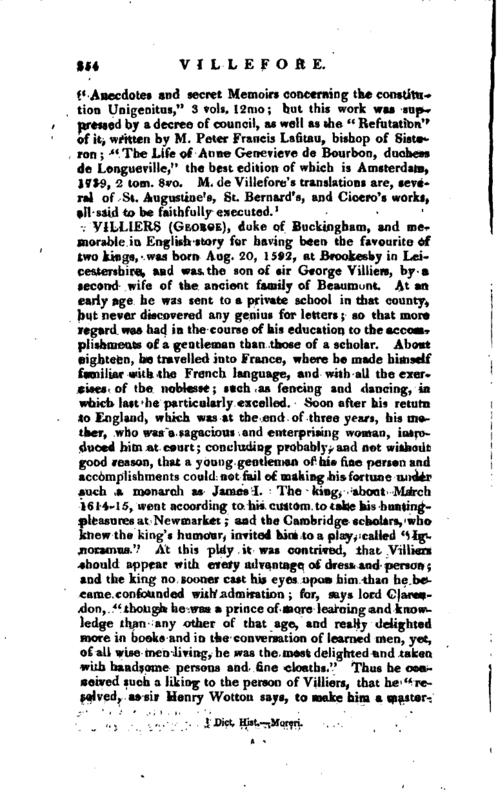 Their endeavours, concurring with the inclinations of the king, made the promotion of Villiers advance so rapidly, that in a few days after his first appearance at court, he was made cup-bearer to the king. Soon after he was made a gentleman of the bed-chamber, and knight of the order of the garter. In a short time, “very short,” says lord Clarendon, “for such a prodigious ascent,” he was made a baron, a viscount, an earl, a marquis; he became lord high admiral of England, lord warden of the Cinque-ports, master of the horse; and entirely disposed of the favours of the king, in conferring all the honours and all the offices of the three kingdoms without a rival. 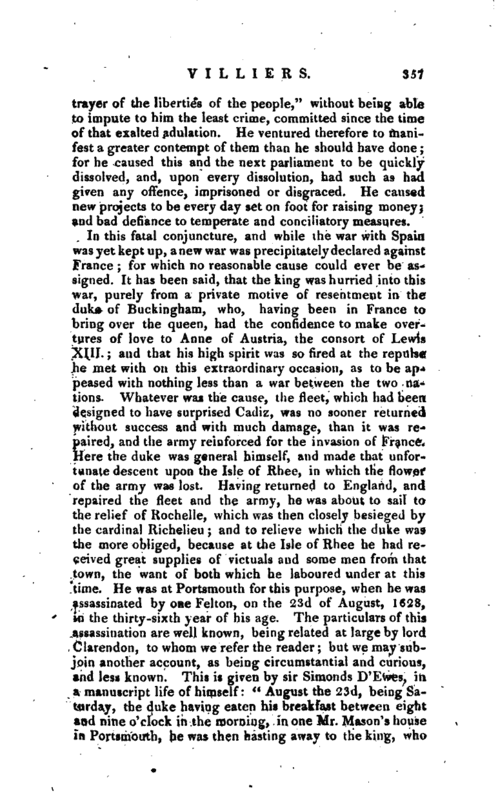 In this he shewed the usual partialities of personal and family ambition, and raised almost all of his own numerous family and dependents, without any other merit than their alliance to him; which equally offended the ancient nobility and people of all conditions, who saw the flowers of the crown every day fading and withered, while the revenues of it were sacrificed to the aggrandizement of a private family. In 1620, the marquis of Buckingham married the only daughter of the earl of Rutland, who was the richest heiress in the kingdom. Some have said that he debauched feer first, and that the earl of Rutland threatened him into the marriage: but this may reasonably be ranked with many other imputations of perhaps doubtful authority, which now began to be accumulated against him. In 1623, the marquis persuaded Charles prince of Wales to make a journey into Spain, and bring home his mistress the Infanta; by representing to him, how gallant and brave a thing it would be, and how soon it would put an end to those formalities, which, though all substantial matters were already determined, might yet retard her voyage into England many months. The king was greatly enraged at the proposal, and the event shewed that he had sufficient reason; but the solicitation of the prince and the impetuosity of the marquis prevailed. 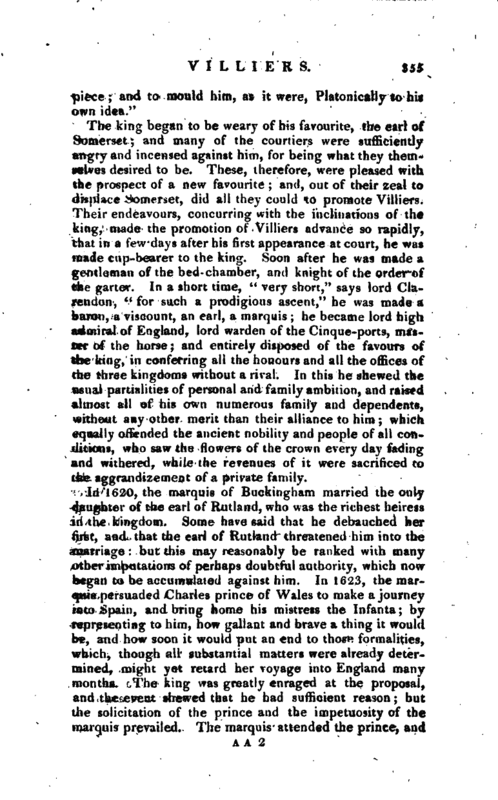 The marquis attended the prince, and | was made a duke in his absence: yet it is certain, says lord Clarendon, that the king was never well pleased with the duke after this journey into Spain, which was totally against his will, and contrived wholly by the duke out of e^nvy, lest the earl of Bristol should have the sole management of so great an affair. Many were of opinion, therefore, that king James, before his death, was become weary of this favourite, and that, if he had lived, he would have deprived him at least of his large and unlimited power; but it did not openly appear that the king’s affection towards him was at all lessened. Charles succeeded to the throne in 1625; and the duke continued in the same degree of favour at the least with the son which he had enjoyed so many years under the father. This greatly disappointed certain courtiers, who, recollecting the great jealousy and indignation which the prince had heretofore conceived against the duke, for having been once very near striking him, expected that he would now take revenge. But, on the contrary, the new king, from the death of the old, even to the death of the duke himself, discovered the most entire confidence in, and even friendship to, him. All preferments in church and state were given by him; all his kindred and friends promoted to the degree in honour, or riches, or offices, that he thought fit; and all his enemies and enviers discountenanced, as he appointed. But, whatever interest he might have in the prince, he had now none with the parliament and people. The parliament, which nad so rashly advanced the war with Spain upon the breaking of the match with the Infanta, and so passionately adhered to his person, was now no more; and the attachment which the major part had for the duke, was changed now into prejudice and animosity. All the actions of his life were scrutinized, and every unfavourable representation given of what he had said and done. Votes and remonstrances passed against him as an enemy to the nation; and his misconduct was made the ground of the refusal to give the “king a supply. 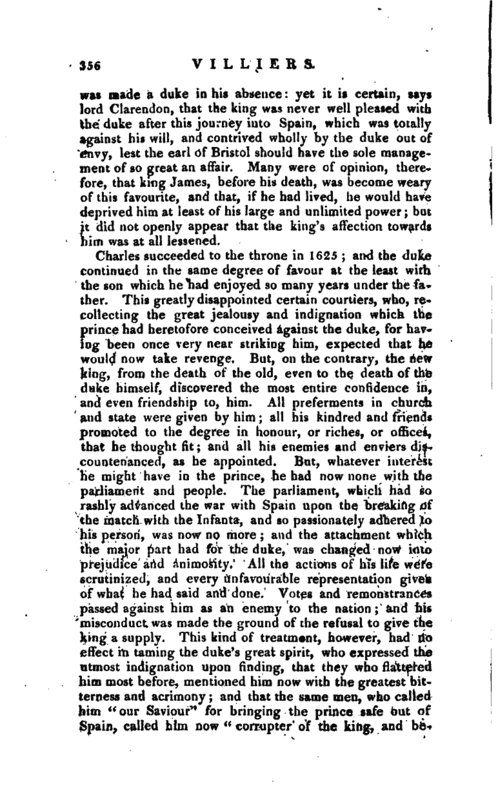 This kind of treatment, however, had no effect in taming the duke’s great spirit, who expressed the utmost indignation upon finding, that they who flattered him most before, mentioned him now with the greatest bitterness and acrimony; and that the same men, who called him” our Saviour“for bringing the prince safe out of Spain, called him now” corrupter of the king, and | betrayer of the liberties of the people," without being able to impute to him the least crime, committed since the time of that exalted adulation. He ventured therefore to manifest a greater contempt of them than he should have done; for he caused this and the next parliament to be quickly dissolved, and, upon every dissolution, had such as had given any offence, imprisoned or disgraced. He caused new projects to be every day set on foot for raising money; and bad defiance to temperate and conciliatory measures. As to the character of this great man, Clarendon says, he was “of a noble and generous disposition, and of such other endowments as made him very capable of being a great favourite with a great king. He understood the arts of a court, and all the learning that is possessed there, exactly well. By long practice in business, under a master that discoursed excellently, and surely knew all things wonderfully, and took much delight in indoctrinating his young unexperienced favourite, who (he knew) would always be looked upon as the workmanship of his own hands, he bad obtained a quick conception and apprehension of business, and had the habit of speaking very gracefully anci | pertinently. He was of a most flowing courtesy and affability to all men who made any address to him, and so desirous to oblige them that he did not enough consider the value of the obligation, or the merit of the person he chose to oblige; from which much of his misfortune resulted. He was of a courage not to be daunted, which was manifested in all his actions, and in his contests with particular persons of the greatest reputation; and especially in his whole demeanour at the Isle of Rhee, both at the landing and upon the retreat; in both which no man was more fearless, or more ready to expose himself to the highest dangers. His kindness and affection to his friends was so vehement, that they were as so many marriages for better or worse, and so many leagues offensive and defensive: as if he thought himself obliged to love all his friends, and to make war upon all they were angry with, let the cause be what it would. And it cannot be denied, that he was an enemy in the same excess $ and prosecuted those he looked upon as enemies with the utmost rigour and animosity, and was not easily induced to a reconciliation. 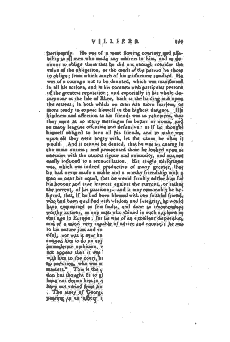 His single misfortune was, which was indeed productive of many greater, that he had never made a noble and a worthy friendship with a man so near his equal, that he would frankly advise him for his honour and true interest against the current, or rather the torrent, of his passions; and it may reasonably be believed, that, if he had been blessed with one faithful friend, who had been qualified with wisdom and integrity, he would have committed as few faults, and done as transcendant worthy actions, as any man who shined in such a sphere in that age in Europe; for he was of an excellent disposition, and of a mind very capable of advice and counsel; he was in his nature just and candid, liberal, generous, and bountiful; nor was it ever known, that the temptation of money swayed him to do an unjust or unkind thing. If he had an immoderate ambition, with which he was charged, it doth not appear that it was in his nature, or that he brought it with him to the court, but rather found it there. 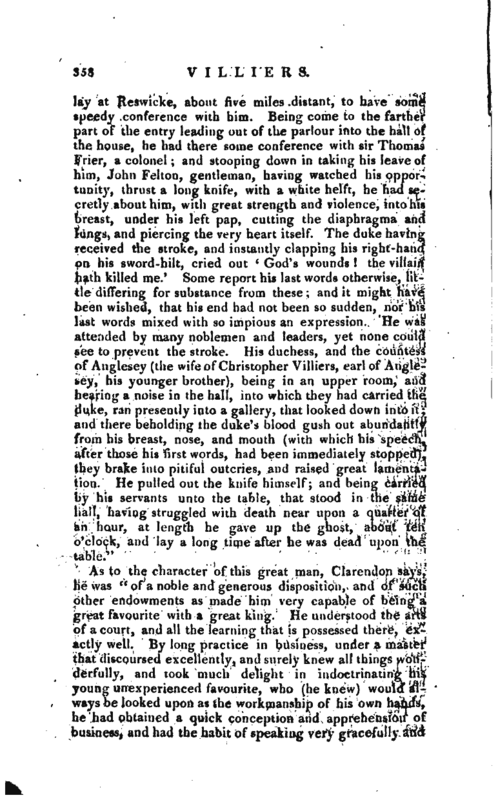 He needed no ambition, who was so seated in the hearts of two such masters.” This is the character which the earl of Clarendon has thought fit to give the duke; and if other historians have not drawn him in colours quite so favourable, yet they have not varied from him in the principal features. Biog. Brit. 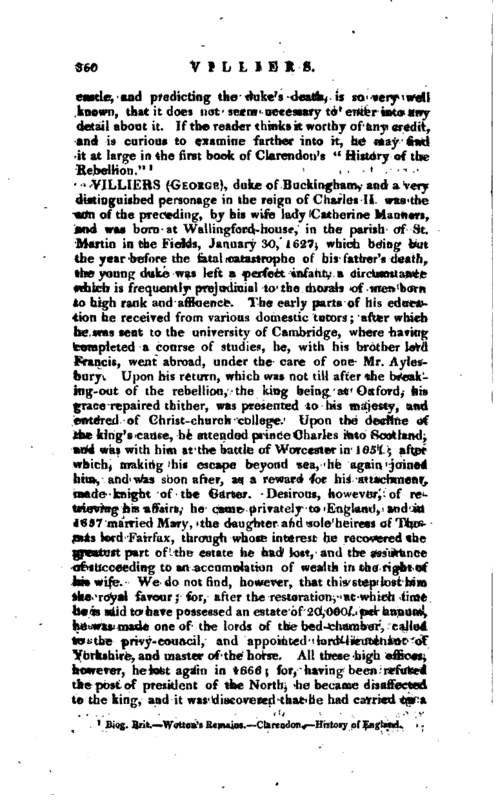 Wotton’s Remains. Clarendon. -History of England.